About halfway between Houston and San Antonio exists the town of Schulenburg, Texas. If you happened to visit their Chamber of Commerce you would definitely be encouraged to visit the four historic Painted Churches in the area. Treasure is found inside each of these churches! 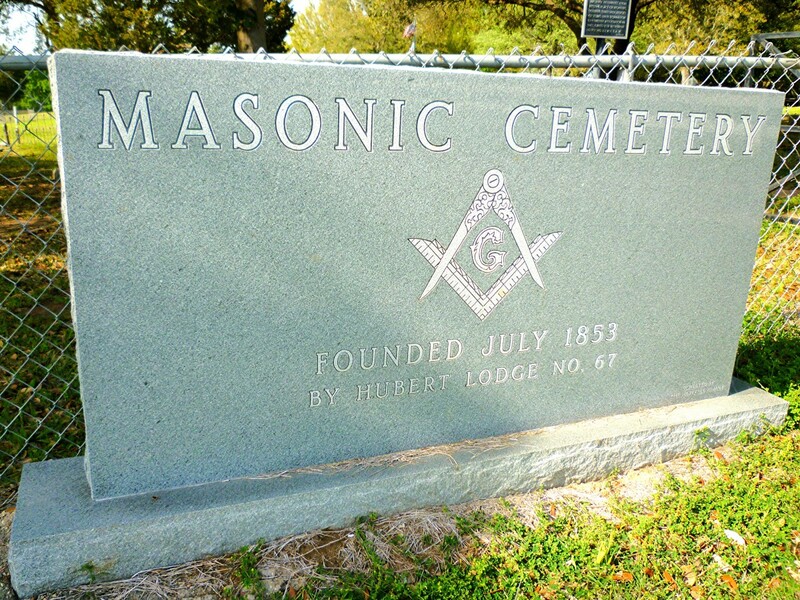 They also serve as memorable monuments to the historic past that is part of Schulenburg's history. Be sure and pick up a map so that you can easily find these Gothic styled beauties. They are not what you might think! On the outside, these churches look like any other. It is the inside of each of these churches that begs further discovery. Let me explain. First of all, you need to know about the immigrants who primarily settled this part of the country. They were mostly made up of Czechoslovakians and some Germans who came to America to better their circumstances. Some came for economic reasons and others to evade religious oppression. Whatever their reasons, they settled in this region and wanted to practice their religion and follow their common Catholic customs. The original settlers in Schulenburg were a hard working and dedicated people. They did not have much extra money to decorate their churches, so expensive materials were not an option. Painters were hired to embellish the inside of each church, ultimately creating inspiring and serene surroundings in which to worship. Supposedly in one case an itinerant painter was hired to do the job. What these artistic painters did was always magical and different. These Painted Churches are listed in the National Register of Historic Places due to their uniqueness, and are well worth visiting. Originally established in 1855, St. Marys received a new exterior from stones quarried from nearby Muldoon, Texas. The "new" church titled the Assumption of the Blessed Virgin Mary was dedicated on November 20, 1895. The painter hired to decorate the interior was a recognized artist by the name of Gottfried Flury. He had done other church murals, and for well over 100 years the ceiling has never had to be retouched. I was inspired and created an original linocut of a portion of this particular church and its steeple. It is titled Praha Prayers. The location of this charming church is located in Dubina, which, according to a historical marker, was the first Czech settlement in Texas. The story told was that the first batch of Czech immigrants spent the night nestled under an oak tree for protection from the elements when they first arrived at this location. Oak tree is called "Dub" in Czech and eventually the name was enlarged to account for the many oaks that grew there. This is how the farming community of Dubina came into existence. Sts. Cyril and Methodious Church was built in 1912. The first church was destroyed by a hurricane 3 years earlier. All that remains from that earlier time is the chandelier, bells, and cross on the steeple. Everything else was damaged beyond repair. 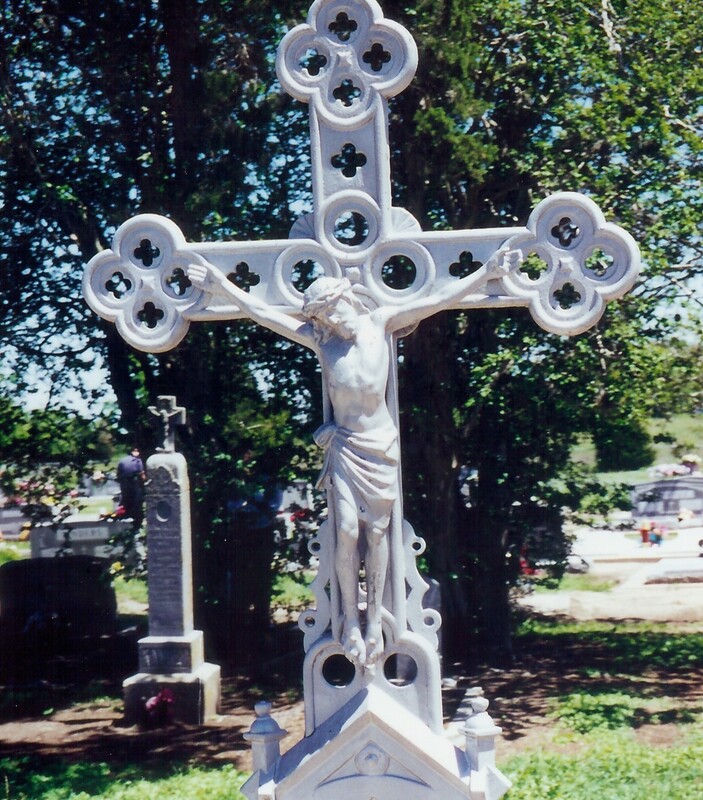 The cross was made by Ton Lee who was a former slave. He worked for the local blacksmith and created the crowning glory for this church which served the local Catholic community. A professional artist was employed to paint the inside, and he utilized frescoes and stencils to create the unique designs. 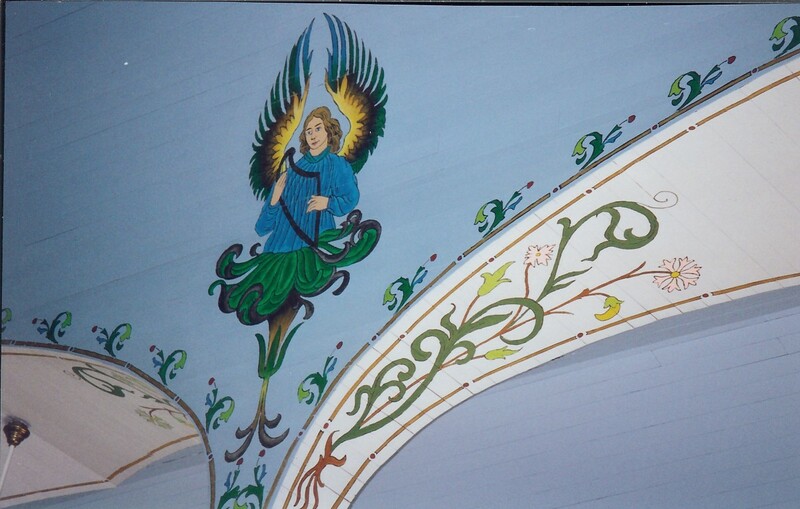 Amazingly, when the church was 75 years old the parishioners painted over the designs! Some years later, when some of the original artwork began to show through the white paint, restoration was begun to uncover and restore the art to its former beauty. Thank heavens we get to enjoy that original artwork today as it was intended to be seen and enjoyed. The angels emerging out of the lily-like flowers with musical instruments in their hands are enchantingly sweet and whimsical. 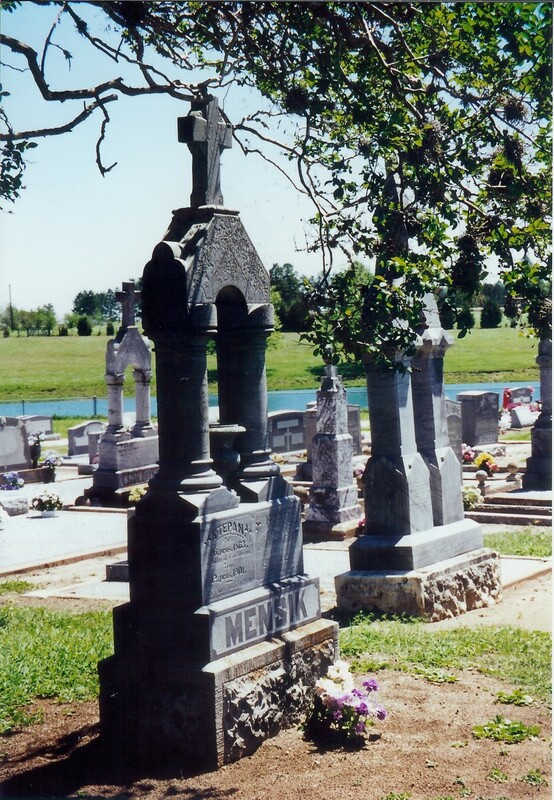 Located at Ammannsville just about 8 miles from Schulenburg, St. John the Baptist Church is the third reincarnation. Destroyed twice, the parishioners persisted and created this Gothic Revival Style Church which is another one listed in the National Register of Historical Places. It was dedicated in 1919 and was painted by an itinerant drifter who happened to come by at the right place and time with artistic talents which still mark this church today with much grace and beauty. 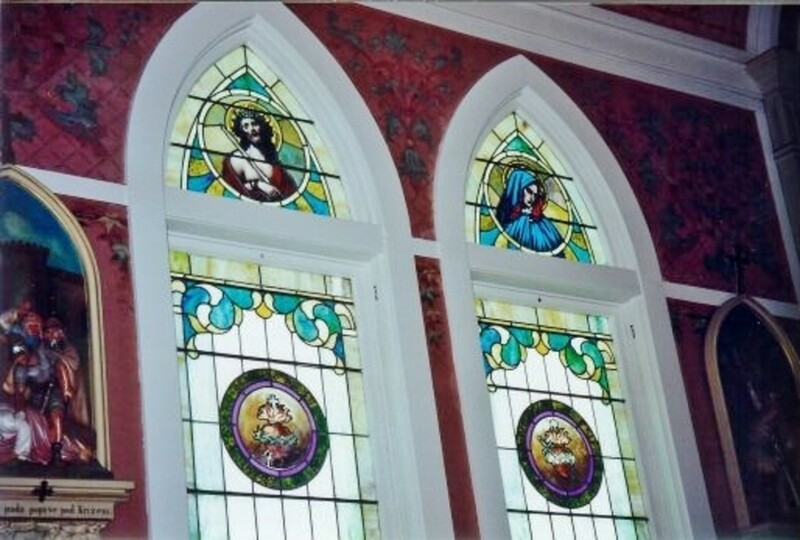 Something of interest regarding the stained glass windows: male saints are on the right side of the church and female saints are on the left side. Each window is inscribed in the Czech dialect. Outside the church is a beautiful country cemetery. Another Gothic Revival styled church, St. Mary's is also listed in the National Register of Historical Places. 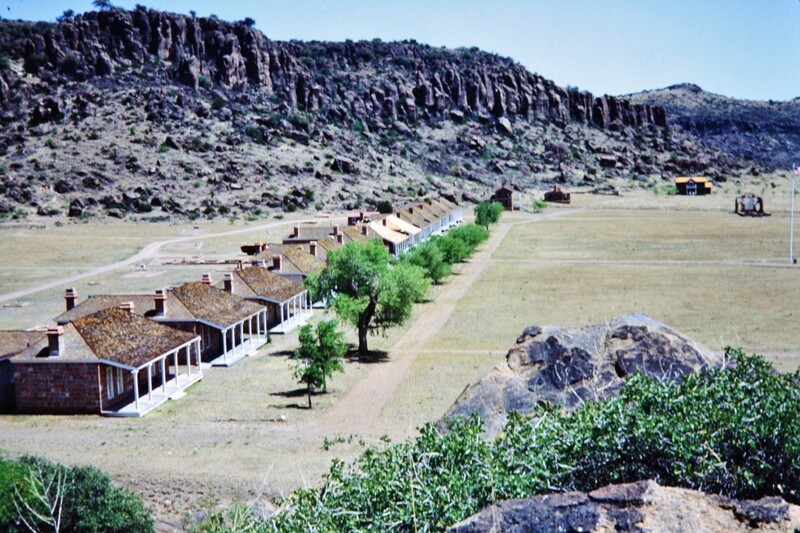 German Catholic families who settled in this area in the mid 1860s started the building of the first church. This is the third one standing since that origination over a century ago. 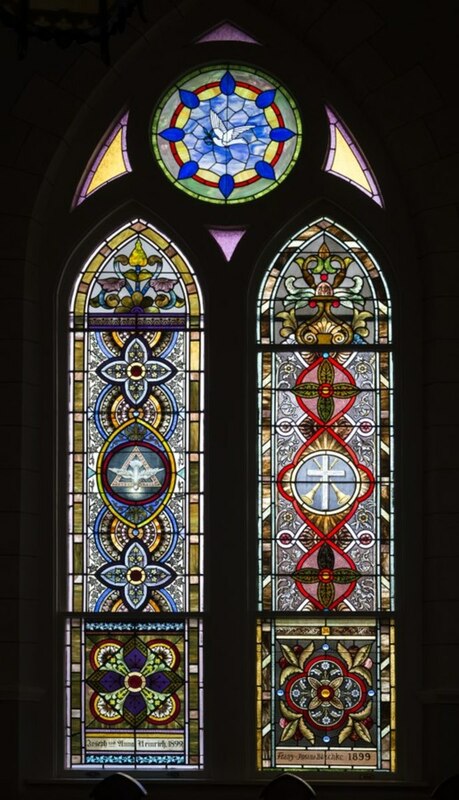 Eighteen stained glass windows were purchased and shipped from Germany to be installed in their place of worship. Beautiful deep colors depicting saints and other biblical scenes add to the beauty inside the church, especially when the sunlight warms those intricate designs in the stained glass and makes them glow. 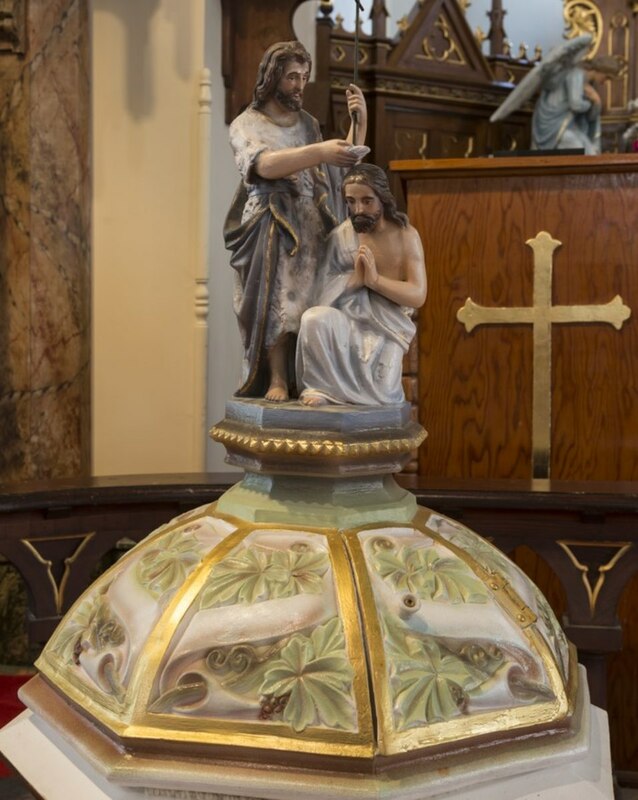 Carved statues of Jesus, Mary and other saints are housed within St. Mary's Church along with unusually beautiful and detailed Stations of the Cross. The height of the steeple is about 175 feet, and the domed interior ceiling is embellished with paintings of angels, grapes, wheat sheaves, vines, birds and other decorations. All of the ceiling paintings are original and have never had to be retouched. The columns inside the church look like real marble but are also just painted and made to look like the real thing. Marble of course is cool to the touch. The painting of the columns is so well executed that if one did not touch the columns one could be fooled into thinking that they are indeed marble. St. Mary's and the three other Painted Churches in the Schulenburg area are well worth a bit of time to visit. 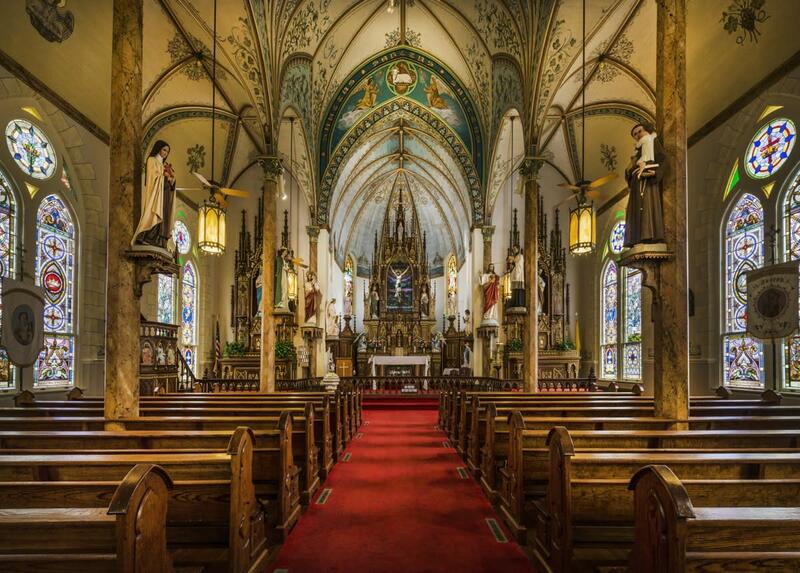 There are other Painted Churches in Texas, and if seeing these four gives you the incentive to seek out and look at more of them then that of course will keep you busy for a while longer. 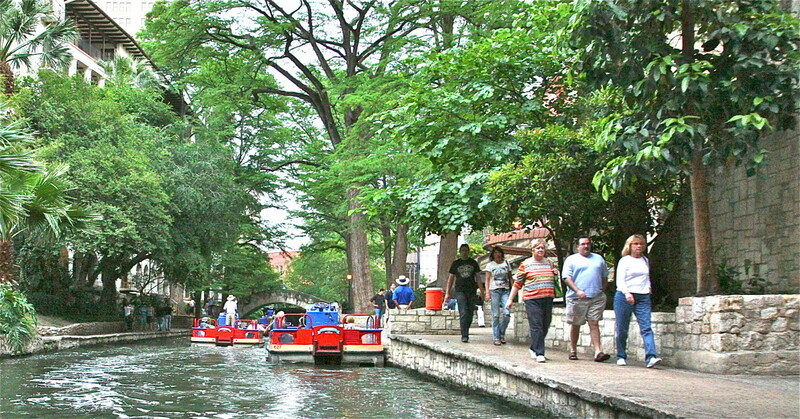 From Houston it is simply a nice day trip and pleasant outing. We always notice a few new details that we missed seeing in former visits. Thanks for viewing and learning about these Texas treasures. When considering Texas sites of interest you might wish to consider putting Schulenburg and the Painted Churches on your list of desired places to visit. 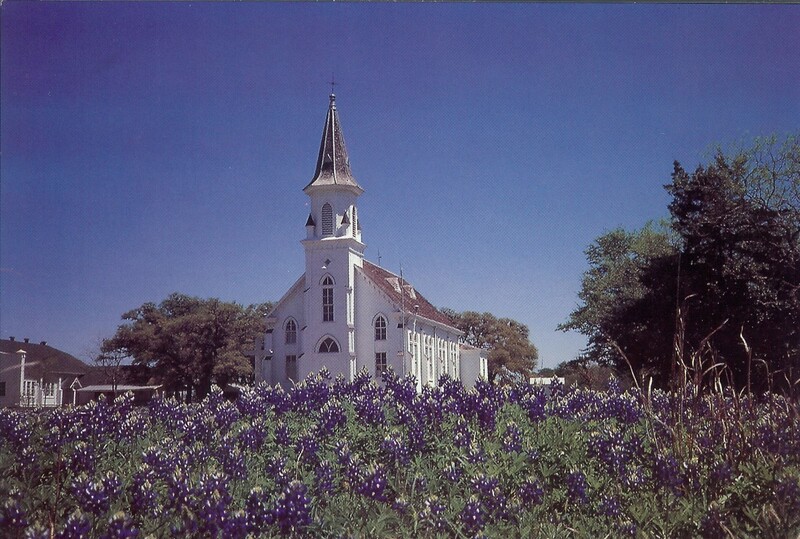 Is there a tour guide or schedule to visit the churches of Schulenburg, Texas? Groups of less than six people can visit the churches from 9 am to 4 pm, Mondays to Saturdays without a guide. Private as well as guided and van tours can be arranged in advance by contacting the Schulenberg Chamber of Commerce at 1-866-504-5294 or 979-743-4514. I would recommend taking a tour to be able to fully appreciate the experience of visiting these amazing churches and hearing the history behind each of them. These are all active churches so if you choose a day to go on your own without a formal tour, be respectful if some other event is being held in them. If the painted churches you visited in North Carolina were anything like these here in Texas, I know you would have had a good experience. Glad you liked seeing these. We have visited these beautiful painted churches several times on different occasions and they are quite amazing to see. Glad you liked getting a look at them via this hub. Appreciate the visit and shares. This is awesome, Peggy. I visited some painted churches once somewhere in Western NC once. I can't remember exactly where. It was a good experience. These churches look beautiful and very much worth a visit. Who would paint over the original designs? That's crazy. 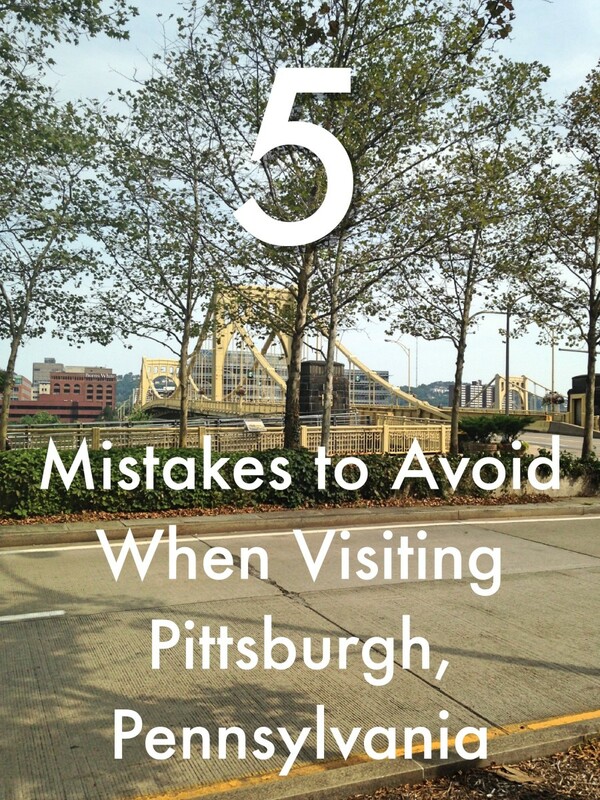 I've pinned this article to my 'Travel' board, posted it to FB, and will share with followers. Another excellent article I haven't seen before! 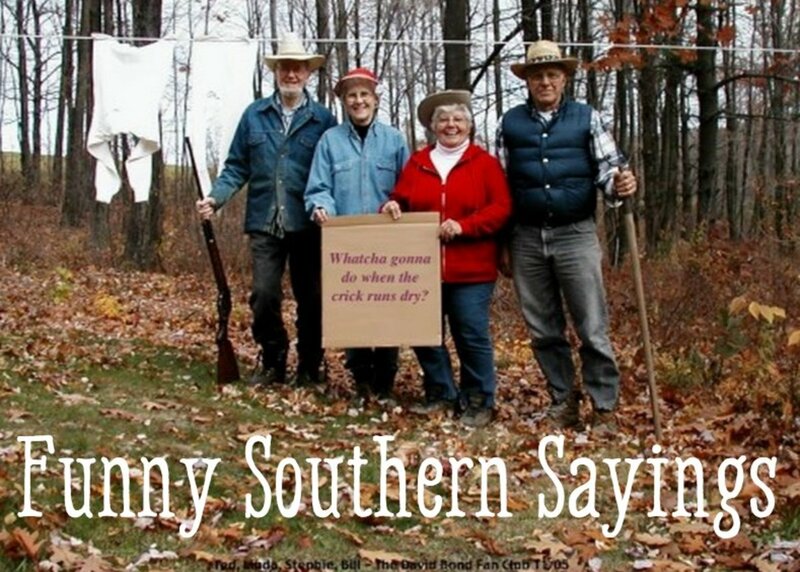 In what part of the country did your grandparents live? Were there any churches similar to these painted churches in that area? I am just wondering if this type of decorating was specific to the Texas area or if it was more of a cultural thing back in those days? Thanks for your comment and votes. Glad that you enjoyed reading this hub. Wow! The inside of these churches are beautiful and I love the story behind them. My paternal grandparents came from Czechoslovakia so this was particularly interesting to me. Thanks for sharing another hub that's pretty to look at as well as fascinating to read. Will also send you an email in case you do not check back here. It has the church information, lodging, dining etc. all in the area. Hope you enjoy your visit there. Amazing! If you hadn't told us the columns are only painted to look like marble, I would've assumed they were the real thing. I was appalled that the one congregation had the audacity to paint over the art treasure in its church, but thrilled that it's all been restored. What WERE they thinking????? So happy to hear that you enjoyed looking at these photos of the Painted Churches in the Schulenburg area of Texas. They are certainly unique and special. Thanks for your comment. Wonderful hub, Peggy! The pictures are beautiful as well. Probably the best way to find them is simply to do a Google Search. Here is a link with 8 of them and a map: http://www.klru.org/paintedchurches/map.html Supposedly there are more than 20 in the State of Texas. I know that there are more in the Texas Hill Country. Good luck with your search! Is there a complete list of all the painted churches in Texas? If so, where? I will agree that just about everyone would enjoy the beautiful colors and subject matter inside these Painted Churches in the Schulenburg area. Thanks for visiting and commenting on this hub. I am not the person to contact regarding that but thank you for liking this hub about the Painted Churches of Schulenburg. The churches are indeed beautiful. hi, if any of the churches need a structural evaluation as to their condition etc, and/or design of upgrading, i would liek to be the engineer to do so! i am Czech and i love the churches. 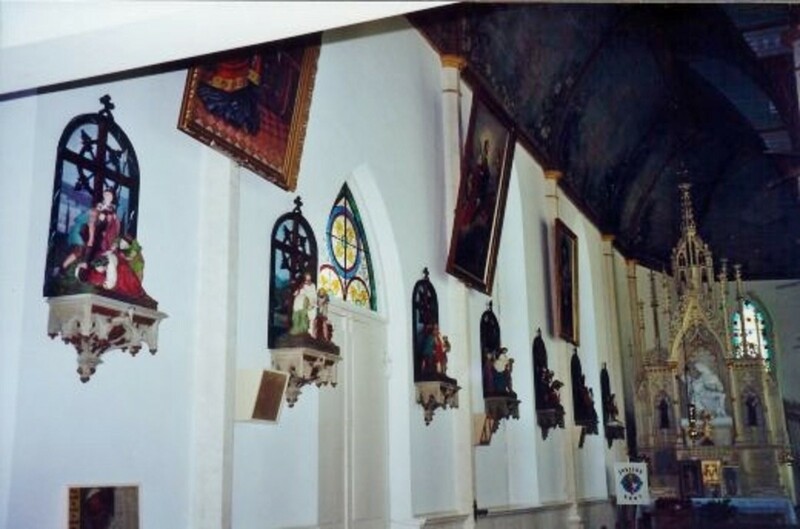 We live in Houston and have visited these Painted Churches in the Schulenburg area of Texas several times. What I would suggest is for you to contact the Chamber of Commerce in Schulenburg and get some information from them as to tours, etc. Another idea...check with the people at each individual church. I am sure that they will be happy to assist you with your research. I am by no means an expert. I agree with you that these wonderful structures deserve more attention. Thank you! These are absolutely beautiful painted churches in Schlunberg. I admire your linocuts. You are a great artist. Thanks for sharing. 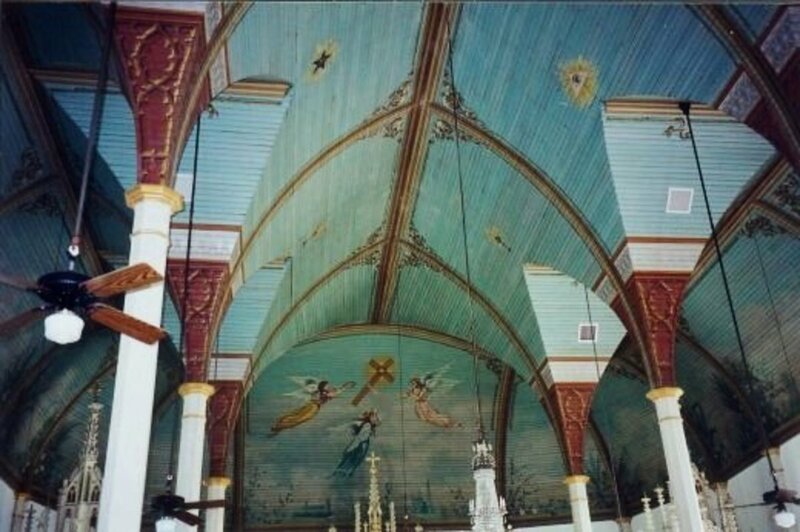 Have you visited the Painted Churches of Schulenburg? A pretty easy days outing from where you live. What a really wonderful hub Peggy. I love the old churches. Happy to hear that you liked this hub about the Painted Churches of Schulenburg. Thanks for the comment. Beautiful Churches, thank you for sharing this with us. If you do a hub about your Dad it will be a lasting memorial for not only your family members but an interesting bit of history for the rest of us also. This could be an interactive way for you and your sister (and perhaps others?) to dredge up all those memories before they are truly gone and forgotten. Just from what you said about him, it peaked my interest! An interesting suggestion. I will have to give it some thought and see what I can dig up in the way of pictures and all.He died 57 years ago and much is lost or forgotten. Some is in a family history my sister did. Some is in my faded memory. How very interesting! You should do a hub about your Dad and include photos if you have them. I think it would be of interest to many here on hubpages. Did he sell his horse statues or just give them away as gifts? And what medium did he employ in making those statues? Seriously......think about doing a hub about your Dad! Thanks! Dad never made a living as an artist but he did cartoon and had a comic strip published in a weekly paper back in the 20's or 30's. He did "chalk talk" in a vaudeville theater.He spent a lot of his time making horse statues, including miniature hand tooled saddles.He painted nature scenes on the walls at home. What type of art did your father create? I would agree that churches have certainly evolved in style over the years. Many large ones in Houston where we live look like office buildings! Personally I like the old fashioned ones best. Thanks for your comment. I find Churches an interesting subject. My father was an artist and not very religious but he admired religious art. I took a short course in church architecture once and foun it fascinating to see the "evolution" on architectural styles over the years. I would agree with you that the photos of the insides of the Painted Churches in Schulenburg add a lot to this hub. Angels emerging from lilies...a tropical paradise with ferns and the like...all so different from what is ordinarily seen and yet so beautiful in a church. Thanks for commenting. So happy that you liked this hub about the Painted Churches of Schulenburg in Texas. Thanks for commenting. Great info, but those pictures of the churches!Oh, my! It was an entertaining read, thank you. Hi Mindfield, Thanks for coming back. I have done that with my art with certain churches offering them 1/2 of the proceeds. I also donate much of my art to raise money for good causes. Thanks for the compliment regarding my art. And thanks for commenting. Peggy - Took me a little longer to get back here and read everything. What a wonderful hub about a place I'd never heard of but would now very much like to visit. I think your own linoleum cut prints are as stunning as the church art. Have you thought of offering them for sale at the churches, giving some portion to the upkeep of the buildings? A win-win situation, I'd say! Thanks for commenting. Do you have photos of your father's church? Would be fun to see the comparisons. Maybe you could write a hub? Great job on this, Peggy. These lovely architectural structures still stand and proud. 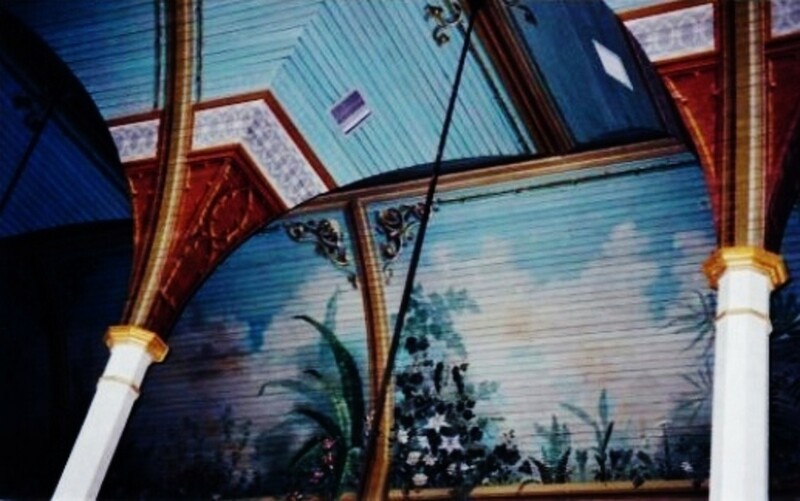 Have seen painted ceilings in the old church of my father's hometown too. It has this and SO MUCH MORE! LOL Thanks for the comment. Peggy W, I dig your stuff. Who knew Texas had all this to offer? Who knew. Excellent. Thanks diamondrose1. If you get a chance to see them in person, by all means do so. Even prettier than the photos can capture. Thanks for the comment. 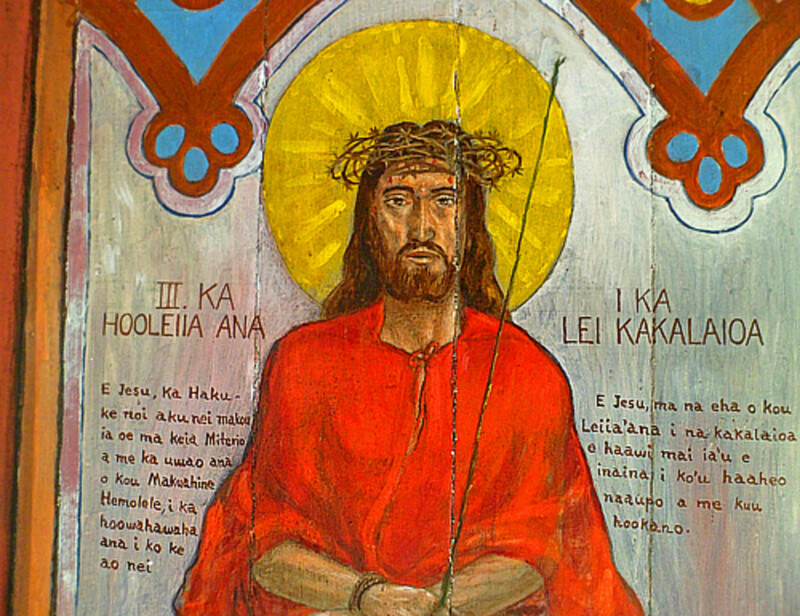 This is a great hub about the artwork in these churches. I'm beginning to think that this was not "a great job." I really do appreciate the correction. Already deleted those photos from St. Mary's at High Hill. Will see about re-entering them into the St. Mary's at Praha. Hopefully I have the rest of this right!!! I truly did want to share these beautiful churches with those that cannot see them in person and also interest others in visiting them if they travel this way. Peggy, I'm from St. Mary's in Praha. The pictures of the Side Altar and Stations of the Cross are not at the St. Mary's in High Hill, they are at the St. Mary's in Praha. Thanks for sharing the news of our churches with others who don't get to enjoy them every weekend. You did a great job! Thank you so much Megan for correcting me in this. Obviously I got it mixed up in my note taking and will correct it in my photo album as well. Will simply delete it from this hub. The Painted Churches are so beautiful and unusual compared to what is ordinarily seen in churches today. They have a very special feeling to them and I just love the artwork. You must love being able to worship in St. John the Baptist Church. I am just letting you know as a member of St. John the Baptist Catholic Chruch, that the cemetary and grotto are NOT part of our church grounds. They belong to a church (not painted) in a small community called Hostyn. Otherwise the article is great. LIttle old fashioned white steepled churches certainly evoke a time and place that used to be typical of churches. 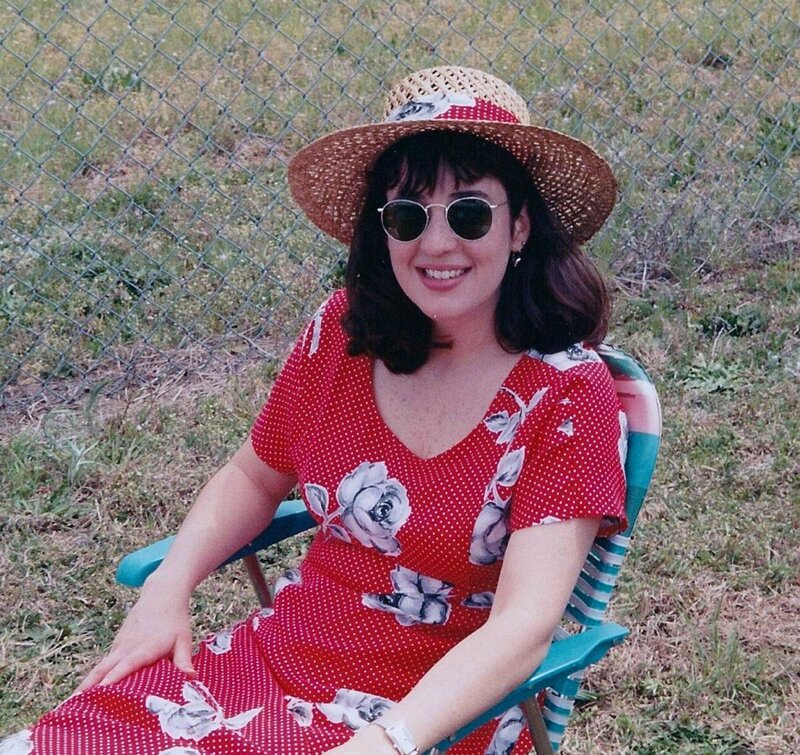 This photo also had the bluebonnets in bloom which meant Springtime in Texas. Glad that you enjoyed the photos. So happy that you liked this hub, G-Ma. I agree that some of the modern ones look and feel more like office buildings than churches. 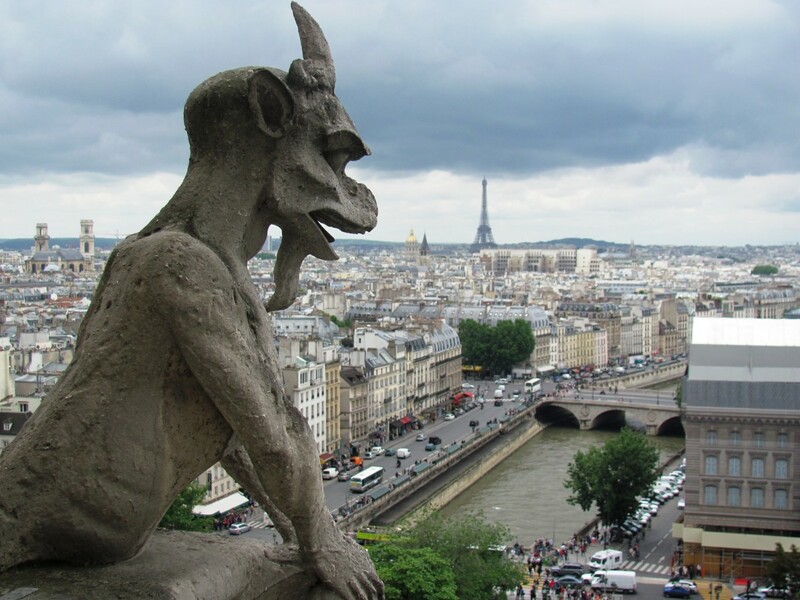 The cathedrals in Europe are truly something spectacular and took centuries to build in many cases. Thanks for the nice comment and hugs back to you. Thanks Colleen! Glad you enjoyed it. Beautiful job Peggy! Loved the images!